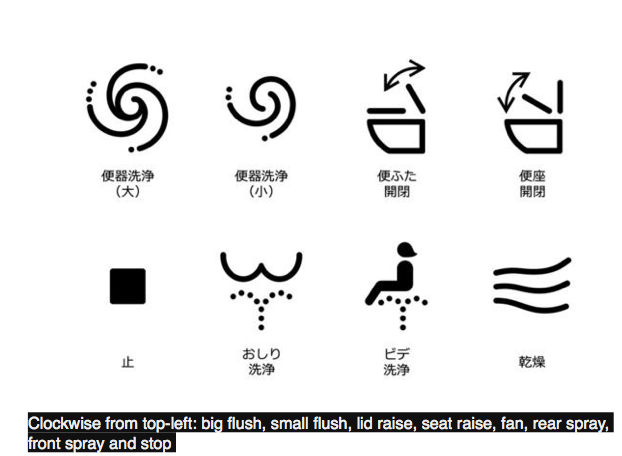 The pleasures of the Japanese toilet are gaining worldwide attention. The BBC in its news today, made an announcement about toilets in Japan. And recently the New York Times ran a feature story on Japanese toilets. Why toilets would qualify as news might puzzle many – but it would not surprise those who have been to Japan. Japanese toilets are quite ingenious. When you arrive in Japan and head for the first toilet you can find in the airport you find that it is impeccably clean, as are all toilets in Japan almost without exception. But you are stopped in your tracks by an electronic panel next to the loo with a dazzling array of symbols. There is so much to read! Do I need a user manual to go to the loo in Japan? Not really, but often you are stuck in the toilet because it’s hard to find the flush button in the dense display of options. Especially since often they are only in Japanese. Welcome to the Toto! It is claimed that once you experience the Toto commode/washlet, you will never again be satisfied with a regular toilet. First, the seat is heated, a surprising comfort that never wanes. Then you have a varying number of functions depending on the model. 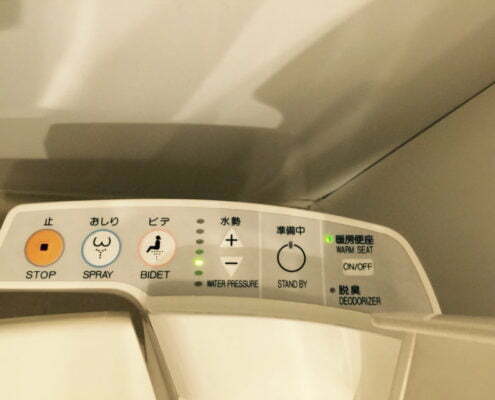 The Japanese have combined in one what the French made separate – a toilet that is also a bidet with special features. You can choose a front or rear spray, the temperature of the water and length of cleanse. You can vary the water pressure. Some have an air-purifying system that deodorises during use. Many have air dryers to finish. While others also provide music or a sound button that plays warbling birdsong or gushing waterfalls to discretely cover your sound. These toilets are ubiquitous throughout Japan, especially in hotels, restaurants and airports as well as private homes. They often exist in public conveniences as a Western-style choice alongside the traditional, squat toilets seen elsewhere in Asia. It seems that the manufacturers of these hi-tech toilets have finally realised the difficulty the dizzying array of options presents to foreign tourists. 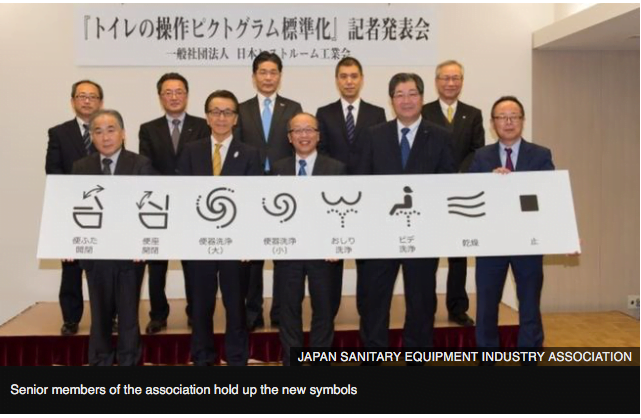 So they have now jointly agreed to standardise and simplify the symbols on the toilet panels and reduce them to only eight new pictograms. 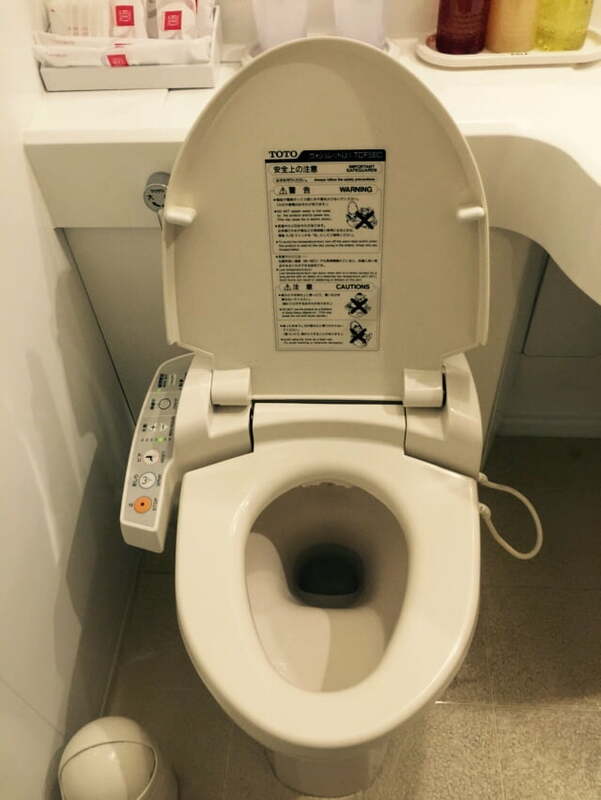 Travellers to Japan, seduced by the temptations of the Toto, have been known to return home determined to find and install this triumph of toilet technology in their own homes. None of them seems to have regretted it.